In 711, a Muslim army invaded and conquered most of what is now Spain and Portugal. What followed was an intermittent and complex season of warfare and crusade known today as the Reconquest, or Reconquista as Christian Kingdoms to the north and east fought to recapture these regions. The movement spanned generations and continued even after the last Muslim kingdom fell in 1492 as the remnants of Islam were prosecuted and expelled. Despite all of its political and social underpinning, the Spanish Reconquista was equally an ideological conquest fueled by a robust crusade theology. While physical armies fought and conquered, the true crusade was one of ideology. Folquet de Marselha (1150-1231) is a fascinating figure. Though certainly not modern in his theology and philosophy, his multifaceted professions and rise to prominence have an almost modern tenor. “A troubadour, then a Cistercian monk, and finally Archbishop of Toulouse (1205-31),”he is a fine case study of the theological perspectives of reconquest and crusade during the period. His basic message offers the pragmatic observation that fighting Muslims in Spain would spare the crusaders the risks experienced during a long, Mediterranean Sea voyage to the Holy Land. However, it is his new addition to the already familiar doctrine of earning one’s salvation through fighting for God that tells us how highly he valued the crusade in Spain. 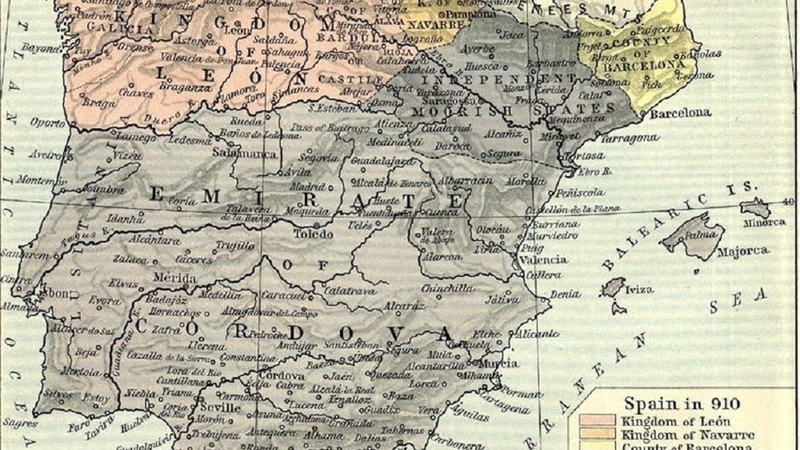 In a bizarre hermeneutic, if also an effective sales tactic, Folquet argues that the initial Muslim conquest of Spain was actually a positive action instituted by the providence of God to bring about salvation for those who would fight in the crusade.Claiming the event was an act of greater grace than the death of Christ on the cross since it offered a means of direct salvation, the archbishop broke new ground in soteriology to be sure.While his sentiments are not widely repeated among his contemporaries, the fact that he is not criticized for this teaching and the mere fact that this idea is a possible extrapolation of the theology of the time demonstrates not only the unique interpretations of medieval theology regarding salvation but also the true belief that the Church was indeed operating as the strong right arm of the Almighty Himself. Folquet de Marselha’s attempts to raise the opportunity of salvation through deeds of conquest to a level higher than the cross do not appear to be common though they are certainly one natural extrapolation of indulgence-based salvation. However, despite Folquet’s efforts to bend Scripture to his own motivations, other writers of the time describe the process of salvation quite differently. This is especially so when Christian apologists were attempting to directly counter Islamic doctrine. One such document is a “MozarabicRefutation of Islam” written in Arabic around 1140 by an anonymous Christian priest in the city of Toledo. The only recorded textual version remaining to history is actually taken from its quotation in a Muslim counter-publication that was produced to refute the points raised by the Christian author. Praise be to God who guided us to His religion and helped us with His right hand and favored us with His Son and His beloved, and extended over us His Mercy, the Crucified One, Jesus the Messiah our God, “who created the heavens and the earth and what is between them” and who redeemed us by His holy blood, and from the suffering of Gehenna. He protected us; and He lifted from our necks the sin which was on the necks of the sons of Adam because of his eating from the tree from which he was prohibited. For the Messiah saved us with His blood and redeemed us and protected us from the suffering of Gehenna. He shed His blood in satisfaction for all of the children of Adam […] Then He descended (praise be upon Him! )after this from heaven to address mankind Himself in order that they have no argument [which excused their unbelief to use] against Him, and that their argument should be immediately cut off because He spoke them Himself, not through a mediator between them and Himself. […] It is part of His perfect mercy toward mankind that He was willing to shed His blood on the wood of the cross. Far from calling for crusade, the author of this piece presents a winsome Christological defense complete with a (small) defense of the Satisfaction Theory of atonement. Further, he presents a universal grace that makes the salvation of Muslims not only possible but preferable.The spectrum of soteriological views is broad between these two examples, yet clearly, a robust emphasis inspired and required a conquest either of soul or of body. Joseph F. O’Callaghan, Reconquest and Crusade in Medieval Spain (Philadelphia: University of Pennsylvania Press, 2003), 179. For the full text of Folquet de Marselha’s sermon see:Carlos Alvar, Textos Travadorescos sobre España y Portugal (Barcelona: Planeta/real academia de buenas letrasBarcelona, 1978), 84-88. Mozarabic is a term that refers to Christians living under Moorish or Muslim rule. This phrasing reflects the style of Islamic writing and its influence in Christian practice. Published in Olivia Remie Constable’s Medieval Iberia: Readings from Christian, Muslim, and Jewish Sources, 143-145. Her English copy is translated from Ahmad ibn ‘Abd al-Samad al-Khazraji, Maqami’ al-Sulban, edited by ‘Abd al-Majid al-Sharfi (Tunis: Al-Jami’ah al-Tunisiyah, 1976), 30-39. A missiological approach to defeating Islam was not unheard of. As will be seen in later apologetic documents, this often occurred inside Spain as scholars and churchmen sought to win Muslim souls to Christ. The most famous figure to attempt this effort outside Spain is Francis of Assisi with his trip to North Africa. Ramon Llull is also credited with working to convert Muslims rather than exterminate them. Inside Spain, a monk, Anastasius attempted to evangelize Muslims but met with no apparent success. See: Vita S. Anastasii, PL 149: 429., and D. M. Dunlap, “A Christian Mission to Muslim Spain in the Eleventh Century,” Al-Andalus 17, (1952): 263-290. For a missiological overview of medieval efforts and debates over converting Muslims see: David Garrison, A Wind in the House of Islam: How God is Drawing Muslims around the world to faith in Jesus Christ (Monument: WIGTake Resources, 2014.